There is no denying that skylights shades are one of the best ways to lighten any dark kitchen space, living room or even a bathroom. It lets you enjoy the beauty of wide and open sky by infusing the room with elegance. But it is very important that they have shades to cover them, otherwise, your space may get overheated. It will not only cause a temperature issue, but also reflect in your utility bills, draining money out of your wallet unnecessarily. If you have regular sized windows in your house, you should know that they limit high-angled glare during summers and catch low-angled rays during winters. The skylight shades do the opposite. For example, skylights in West or South roofs usually overheat the room. In the same line, skylights facing North, rather diffuse the light softly, but do not create that sun-washed look you might be looking for. That is to say, knowing the types of skylight shades to choose the most appropriate one for the rooms in your house is very important. However, before we plunge into the discussion of how can you buy skylight shades, let’s see why choosing these cool-impacted shades for your home is beneficial. Why Should You Choose Skylight Shades? It is known for a fact that skylight may change the entire look of your room, adding more character to them. Not only do they add brightness, but also bring a sense of style and spaciousness to the room. Basically, it scatters sunbeams/ rays throughout a dreary space to brighten it and captures a beautiful view from an attic home space. It can add a starry-skied panorama. In addition to that, switching to skylights is a great way to reduce your utility bills. It reduces the need of electric light, while delivering warmth of summer in winters. Similarly, this warmth turns into cooling in summers. That means skylights minimize the need of fuel-based air conditioning as well as heating. It also promotes air circulation as it releases warm air if it rises naturally. Before you make a decision to purchases skylights, make sure you know their various types available on the market. Skylight is made of operable or fixed glass and plastic. It comes in various styles and sizes to illuminate insulated glazing, louvers, and shades. All of them have excellent UV blocking features. Knowing the proper size and the right material that meet the needs of your house is the key to buying skylights. Here are few go-to options, each with particular qualities to help you buy them. This is one of the best options to buy skylight shades as they soften and diffuse the light from coming in. Not only they reduce the glare, but also protect your carpets and furniture from fading. These shades are great when it comes to reducing and redirecting incoming light. It is the aluminum construction that makes them an ideal choice for humid environments like bathrooms or kitchens. As me mentioned earlier, skylights come in various operable models, out of which most of them are hinged at roof. You can open them a few inches to improve air-circulation in the room. These skylights are excellent filling option for your space to allow natural light to enter the room. However, they can be problematic when it comes to heat build-up in the room. If the swirling rays pour into the room, it can get completely unlivable. This is where you need operable skylights that you can open and close to ventilate and get fresh air. 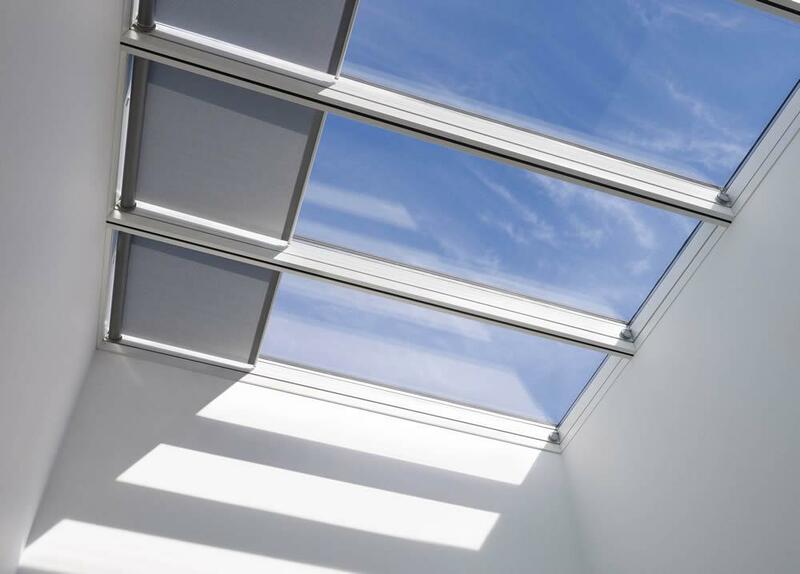 Despite the fact that operable skylights cost 40 percent higher than fixed skylights, they can do a terrific job to make your summers comfortable. You have two options here as you can choose motorized skylights or manually operated skylights. Controlled by a hand-held remote, it is a convenient and modern option when it comes to buying skylights. They are a wonderful option to prevent heat loss, particularly at night. You need routing electric wires to operate them. They often come with two-function model switch, which can be mounted on the wall. The great thing about using motorization is the blinds don’t have any cords. The US consumer product safety commission has voluntary standards that many companies that sell blinds follow. The modern and elegant option, though a bit expensive is a perfect option to make your life easier. Automatic skylight shades have sensors that can detect moisture, rain or any other thing that can enter your interior space. The sophisticated models close automatically when temperature in the room reaches a certain level. If buying motorized or automatic skylight shades is difficult for you, you can buy manually operated skylight shades like tinted glass or blinds. They are economical, meet your budget, and do the job for you. They provide natural light and fresh air.